This page is meant to give you a general view on who we are who are building uboat.net, this page is a pretty informal one and each and every one of us will eventually have his own style when writing about himself. Owner and maintainer of uboat.net, research, design, programming and editing. Here I am 5 years old. 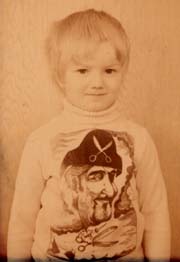 This is probably the origin of my naval interest (shirt is from UK-Iceland cod wars of '75-76). [In 1972-1973 and again in 1975-1976 Iceland "fought" 2 cod wars with UK and Germany for the most part. This was over fish stocks around Iceland, we won of course :) However, we had frequently on TV super shots from one of the HMS frigates trying to ram our little gunboats and that is probably where my naval interest came from. Difficult for a 5-year old to resist such cool-looking events!]. Rainer was born in Switzerland in 1979 where he still lives and works as computer specialist. His interest in military history already began at the age of ten when he read his first book about the Second World War, experienced firsthand by his Polish grandfather. Main focus: U-boat successes (the huge merchant database). He really has done a brilliant job on this impressive dataset. Daily U-boat positions, Attacks on U-boats, Wolfpack and Convoy operations. The other Brian is also working on the Allied Warships section. He nicely offered to help Brian and has sure been helpful. This trio of talents is working on the WWI databases (fates, commanders). Tonya Allen, an American, works mainly on the movies and books sections, and has written articles on the Athenia and Leopoldville sinkings. Jürgen, an engineer living in Mainz, Germany, is doing various research and data checking for uboat.net and collected the data for the Knight's Cross page and is doing a large set of pages on the commanders themselves. In short he is the man behind most of the research on the U-boat Commanders. Me and Jürgen created all the 1157 of those new and complete U-boat profiles during Sept 96 - Jan 97. Don is a retired electrical engineer who worked on the design and development of underwater weapons systems for the US Navy. 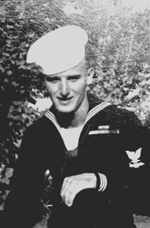 Don was a crewman on USS Guadalcanal CVE-60 during the Battle of the Atlantic in WWII. He has been working on Fighting the U-boats pages. Clemens, 30 years old and from Germany, wrote the pages about Admiral Dönitz and the Nuremberg trials and supported the work on the book pages and several operational pages. His latest addition was the comprehensive overview of the U-boat war in World War One. Forest is an American who is working on Fighting the U-boats pages. Emmanuel is a Belgian who is writing many pages for the upcoming page of Fighting the U-boats among other things. He also wrote 3 Technology pages for the main site. Sandro from Germany, 29 years old, rode on the Bundesmarine destroyer 'Hessen'. Works on the Glossary-page and some technology pages. Marcin has done work on many projects such as the Biggest U-boat Victims and the excellent 5 page Monsun boat narrative. There have, of course, been loads of other contributors over the last 12 years and without them and their assistance this site would be next to impossible to maintain.